Black, green, herbal – we all know these types of tea. But did you know that herbal tea isn’t actually tea at all? Although tea is already the second most-consumed beverage in the world, it’s become increasingly popular in the United States over the last several years. 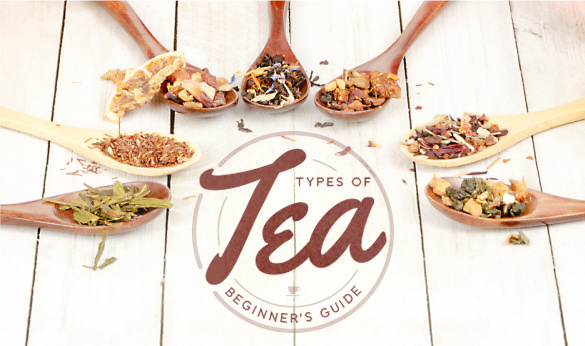 With so many types of tea available, this hobby can seem a little overwhelming to newcomers. Whether you’re an operator hoping to start a tea program or a caffeine fan seeking an alternative to coffee, this handy guide will explain what tea actually is, break down the different types of tea, and offer tips on how to steep them. We spoke with tea expert Sarah Chapman, owner of Vida Pour Tea in Greensboro, N.C., to get the scoop on everything from water temperature to health benefits. For tea to truly be “tea,” it must contain leaves from the Camellia sinensis, a plant that is typically found in China and India. True teas include black, green, oolong, and white – all of which differ in caffeine levels and the way they are processed. “Herbal tea does not actually contain any tea from that camellia plant whatsoever,” says Chapman. Instead, herbal tea usually contains herbs, spices, flowers, and fruits; some popular herbal infusion are rooibos and yerba mate. White tea gets its name from the white hairs that grow on the buds of unopened leaves. These leaves are plucked from the plant and then dried, either in a tumble dryer or naturally in sunlight. This tea is considered the most delicate of the different types since it doesn’t go through a rigorous process and has the least caffeine of all the true teas. When it comes to flavor, white tea is typically floral, fruity, delicate, and sweet. It should be steeped at about 190 degrees Fahrenheit for 3 to 5 minutes. Popular types of white tea include silver needle, white peony, and Darjeeling white. Expert Insight: White tea’s health benefits can include skin and cell renewal. Most true teas go through oxidation – the process of drying, withering, rolling, and treating with heat – but green tea isn’t oxidized. Since it doesn’t go through this process, green tea typically retains its color, tannins, and minerals. The leaves are plucked and heated by steaming or pan frying, preventing oxidation. This type of tea has more caffeine than white tea but less than oolong and black. Once brewed, the tea is light green or yellow and ranges in flavor from sweet to vegetal depending on the process used by the tea master. Most people find that green tea can be bitter, but this flavor comes from improper steeping methods. Green tea should be steeped at 180 degrees Fahrenheit for 2 to 3 minutes. Some popular varieties of green tea include matcha, gunpowder, and sencha. Expert Insight: Green tea is well-known for its many health benefits, including metabolism boosting. Since it is partially oxidized, the flavor and caffeine level of oolong tea falls somewhere between green and black tea. The leaves are rolled, pan fired, and then oxidized; this process can be repeated as many times as the processer wants. Oolong’s popularity is rising due to its reputation of helping with weight loss. The shape of oolong leaves also differs from other types of tea. They can come in thin strands or be rolled, twisted, and curled into tight balls. Oolong’s flavors are just as varied as its other qualities – they can be light, robust, floral, grassy, nutty, or a variety of other flavors. Oolong should be steeped from 180 to 200 degrees Fahrenheit for 1 to 3 minutes. Expert Insight: Oolong is one of the most popular types of tea among tea hobbyists. Black tea is the most popular type of tea around the world. In the southern United States, you’ll typically find it served as sweet tea. In the East, it is usually called “red tea” because of the reddish color it has once it is steeped. To create black tea instead of green tea, the leaves must fully oxidize before the heating and drying processes. The dark brown color of the leaves comes from this full oxidation process. Black tea has the most caffeine of all the true teas. To brew black tea, the water should reach 212 degrees Fahrenheit and the leaves should steep for 3 to 5 minutes. Its full flavor profile – which can range from earthy to citrusy to malty – typically makes black tea the choice for an afternoon tea to pair with sweet and creamy foods; in many countries, sugar and milk or cream are added to black teas. Expert Insight: Black tea is great for cardiovascular health. As we mentioned before, herbal teas do not contain any leaves from the Camellia sinensis plant, separating them from true teas. Flavors depend on what is in the tisane, so they can be floral, citrusy, spicy, or earthy. Tisanes should be steeped at 212 degrees Fahrenheit for 3 to 5 minutes. “Rooibos also falls under the category of an herbal tea, especially in the United States,” says Chapman. Rooibos, which does not contain any caffeine, comes from the Aspalathus linearis plant in South Africa and is also known as African red tea and red bush tea. Its production process includes withering, rolling, oxidizing, and drying to turn the leaves from green to their signature red. Rooibos is prepared the same way as any other herbal tea: by steeping at 212 degrees Fahrenheit for 3 to 5 minutes. Typically, the flavor profile of rooibos includes woodiness, spiciness, and sweetness. Herbal tisanes typically do not contain caffeine, but yerba mate is one of the few herbs that does. Native to South America, yerba mate is processed by removing the leaves and stems from the plant and letting them dry. Its flavor ranges from earthy to vegetal. This type of tea should be steeped at 160 to 180 degrees Fahrenheit for 6 to 7 minutes. While most tea won’t ever “go bad,” it can become stale and lose flavor over time. If you have loose leaf or bagged tea, it should be stored in a dark place in an airtight container to retain its freshness and flavor. You’ll want to keep tea away from light, heat, and moisture to keep it from degrading. Visit the Vida Pour Tea website to browse all of Chapman’s tea blends, or check out KaTom’s selection of tea supplies to find the teapots and infusers you need to start drinking tea. After graduating from the University of Tennessee with a degree in English, Courtney Dyke married the love of her life, Mitchell. Soon after their nuptials, they adopted their miniature black-and-tan dachshund, Hazel. Rarely spotted without a cup of tea, she spends her time reading novels, crocheting up a storm, belting numbers from her favorite musicals, and watching Disney movies. Like a true Hufflepuff, if she's not doing these things, you can probably find her at Chick-Fil-A.